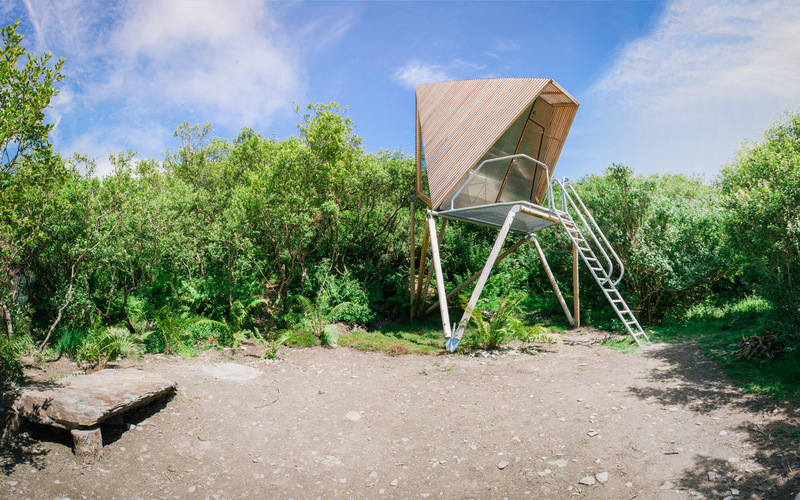 A quirky camping experience in a disused quarry is geared to challenge with its wild swimming, tree tents and Triffid-like cabins. AUGUST 22, 2017 by: Horatia Harrod. Photo: One of the four cabins at Kudhva, North Cornwall. It is close to midnight when a taxi drops me off at the entrance to the Prince of Wales quarry in north Cornwall, at the bottom of an unmarked track leading upwards into the darkness. Already it has been raining for hours, and shards of slate and rivulets of water glint in the headlights. Only in Britain, I think, could the beginning of a summer weekend feel like the opening scenes of a police procedural. Quarries all along this stretch of the Cornish coast, have shipped slate around the world for the past millennium. 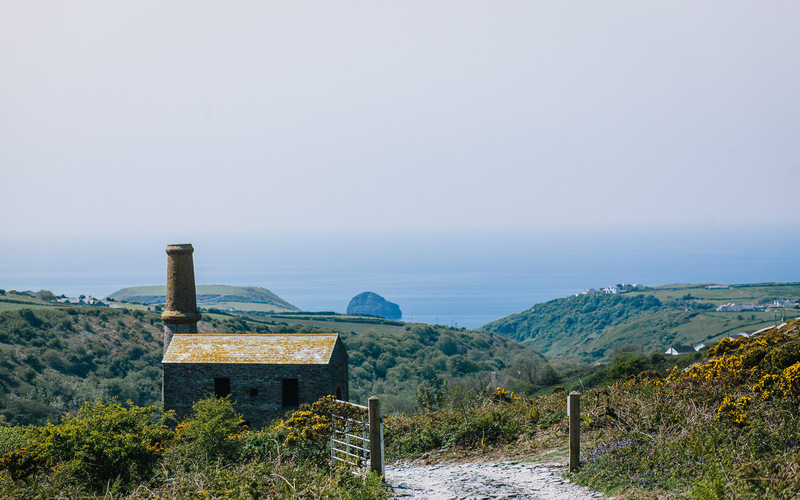 The Prince of Wales quarry, near the hamlet of Penpethy, doesn’t have the pedigree of the one in nearby Delabole — mentioned in the Domesday Book, and still in use today — because it was only in operation for a couple of decades in the late 19th century. Since then it has been left to ramblers, ravers — who held illegal parties here in the 1990s — and a guerrilla gardener who cultivated a tiny patch of its 45 acres. Even two years on, there are tracts of the land that Middleton still hasn’t visited. But she is well into the process of reimagining a small plot of it as Kudhva (the Cornish word for “hideaway”), a place to stay in cabins or tents, to explore, forage and swim in the reservoir. This is its first summer and it is, she admits, a work in progress. 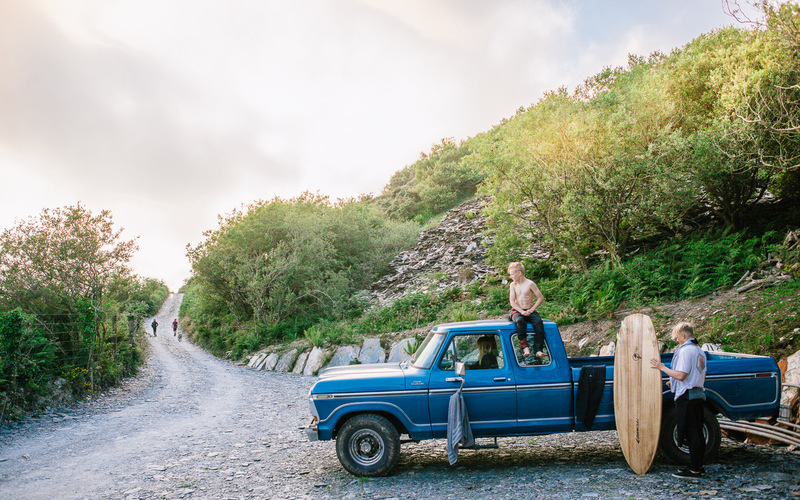 Occasionally — when the solar showers stop working, or the 1978 Ford pick-up, intended to ferry visitors to the beach, breaks down — it is a little like being thrown into a touch-and-go episode of Grand Designs. For £45, adventurous types can stay in one of six Tentsiles, tents strung a few feet above the ground from the branches of willow trees. Or, for rather more, they can find their way to one of four wood-and-steel habitations designed by Middleton and architect Ben Huggins: towering, eight-legged structures also known as “kudhvas”, which poke their heads above the tree line. On our last day at the quarry, we decide to venture to the reservoir, enticed by a promise of wild swimming. Middleton hasn’t cut a path there yet, so she accompanies us down a steep slope, across giant wobbly rocks, through thickets of brambles and under a barbed wire fence. Arriving at the reservoir, we make our way along a wall that drops down to the water on one side, and to a road on the other. A prehistoric-looking cliff face looms above us. The water is yellow and opaque. “Have you found any bodies in there?” asks my partner, as we tentatively strip down to our swimming gear. No, Middleton replies, though a diver did find a mean-looking 10ft spike once used in the quarrying process, now resting against the wall. “I should probably move that,” she says cheerfully, before executing a perfect shallow dive into the murk. A few days later, I speak to Ben Huggins over the phone, and he makes a telling point. “I think there is going to be a fair degree of sorting the wheat from the chaff when it comes to who is going to like Kudhva and who’s not going to like it.” Middleton is entirely at ease in these surroundings. As I launch myself into the water, clinging to a child’s surfboard I find discarded at the water’s edge, I can’t help feeling that I have been tested, and found wanting. I turn around, and kick for shore. Horatia Harrod was a guest of Canopy and Stars, a website offering quirky accommodation across Europe. It offers cabins sleeping two from £114 per night. Here is a link to the Article on the Financial Times Website. Copyright The Financial Times Limited 2017. All rights reserved.